A group of 20 young boys from Kolkata along with their six caretakers today enjoyed a toy train ride, one of the many activities that have been packed in their Darjeeling itinerary. They are former street children, all under 10 years of age, who have now been taken under the wings of the Bekind Ireland Foundation. Bekind Ireland founder Brian Flannagan, and his wife Martina Flannagan, are Irish citizens. The foundation was initiated in 2006 and is supported by the Hope Foundation which has been working in Darjeeling since 1999. It currently supports 20 boys below the age of 20 at a boys’ home in Kolkata. They are all being taken care of and educated in English medium schools. After the age of 10, the children move to the Aashirvaad Boys Home of the Hope Foundation in Tollygunge. There they are taken care of and supported until they turn 18. None of the directors or the staff receives a salary and the bulk of the donations that come from benefactors go towards the wellbeing of the children. The boys are sponsored by families in Ireland. 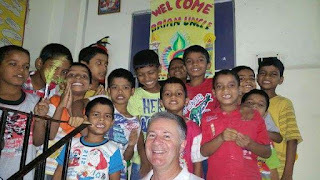 In addition, Irish students aged between 15 and 16 come to Kolkata every year to interact with and help the boys.